What happened to St. John’s, Speedway, can happen to almost any small congregation. A few major pledgers die, or move away, or go into nursing care, all in the same year. Suddenly there is a hole in the budget that reserves won’t cover forever, and your cranky old building is still in need of regular maintenance. Then what? Some churches close. Others, lucky enough to have endowments, spend down their principal trying to stay open. St. John’s made a different choice. On Dec. 2 at 4:30 p.m., the Rev. Dr. Shannon MacVean-Brown will lead the final service in St. John’s current home on West 30th Street in Indianapolis—a liturgy of sending that she is writing herself. On December 9, the congregation, which now numbers about 25, will move into a rented conference room at the Brickyard Crossing Golf Course where it will worship while it continues to minister in the community. This bold choice earned the parish praise in the convention address Bishop Jennifer Baskerville Burrows delivered earlier this month in Bloomington. “A congregation with a clear call to serve its community in a mission-critical area of our diocese, they realized that the cost of worship in their building was more than they could handle,” the bishop said. “After months of evaluating finances, experimenting with being a church without walls, and a discernment process led by a consultant in congregational vitality, they have decided to end their time of worshipping on West 30th Street. But they are not leaving their neighborhood. 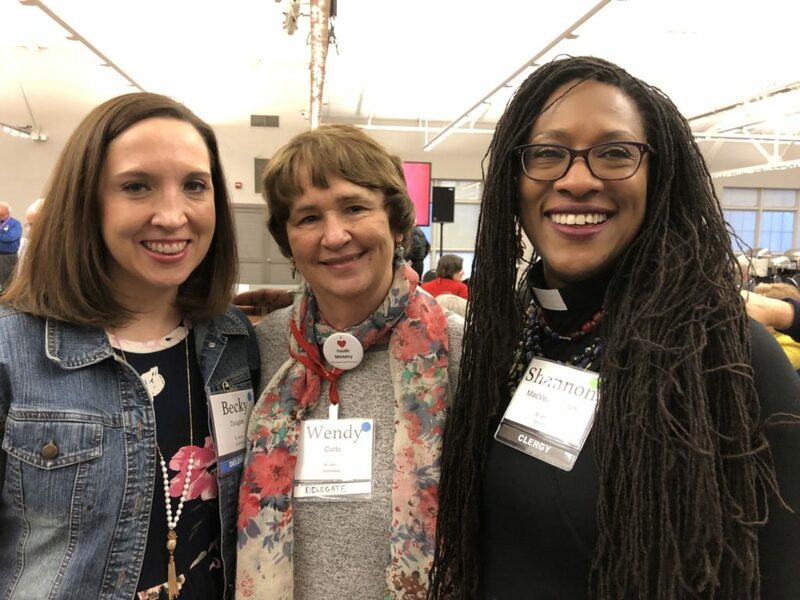 The road to Brickyard Crossing has not been an easy one, as MacVean-Brown, the congregation’s part-time transition priest, Becky Douglas, the parish’s senior warden, and Wendy Curto, a longtime parish leader, explained in a workshop at diocesan convention at the Monroe Convention Center in Bloomington earlier this month. Last year, the departure of several of the parish’s biggest pledgers worsened an already shaky financial situation, compressing the time in which St. John’s had to make important decisions about its future. “We were in a state of grief as we went through this experience,” Douglas said. Rumors flourished, Curto said, and some members of the community declared quickly that they would not support a move from the building, even though, financially, there was little choice. The experiment got off to a rocky start. The first facility the parish rented advertised itself as compliant with the Americans with Disabilities Act. It wasn’t, and eight parishioners were not able to get in. Nasty emails circulated speculating about the true intentions of the bishop, MacVean-Brown and parish leaders. “It wasn’t pleasant,” MacVean-Brown said. The congregation next rented space at Brickyard Crossing, which was not only ADA compliant, but had a welcoming management team that now allows St. John’s to keep the room it rented arranged for worship. Each Sunday after the post-Communion prayer, parishioners filled out a survey, the same one each week, giving parish leaders a way of tracking changing attitudes and levels of comfort with the experiment. As the summer wore on, comfort increased. The parish was guided through the process of making a decision about its future by Hope Partnership for Missional Vitality. As the process wore on, leaders also began to realize that the process they had undertaken might be relevant to the wider church. At one of the parish’s workshops at diocesan convention, Douglas asked how many of those in the room were from small churches with potentially precarious futures, and more than 20 of 30 hands went up. MacVean-Brown chimed in. The church, she said, is in the grip of “a false narrative.” Episcopalians have a “false image” of the church. As the leaders of St. John’s considered their decision, the gospels prescribed for this year were helpful. At the outset of their experiment, MacVean-Brown was able to tell them that while they, like the disciples on the stormy Sea of Galilee, might have feared that they would perish, Jesus had other plans for them. And as their last Sunday on West 30th Street approached, she was able to tell them that they, like Lazarus, might need to be patient with themselves as they lived into their new life. After informing the diocese of their decision to leave the building where the parish has worshiped for 60 years, parish leaders began pondering what belongings to take with them. They decided on the altar, the baptismal font and the gospel book. They considered taking a particular crucifix, but Douglas said it wasn’t necessary. “We are leaving our possessions and moving on,” she said, a sentiment in keeping with one of the principal themes of the convention, following Jesus lightly into the neighborhood.